Description: Heaven 7" UK 45 black framed. Signed by complete original band: Jani Lane, Erik Turner, Jerry Dixon, Steven Sweet and Joey Allen in red and blue sharpie pens. Note: Item signed on Warrant's 1990 US tour at Reunion Arena in Dallas Texas. Description: Warrant Cherry Pie CD box cover. Signed by complete 2001 band in blue sharpie pen. CD not included! Note: This item signed on Warrants 2001 US tour at the Starplex Amphitheater in Dallas Texas. 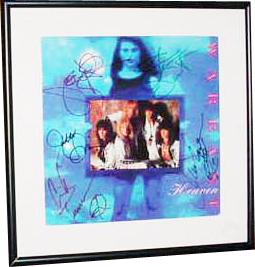 Signed by: Jani Lane, Erik Turner, Billy Morris, Jerry Dixon, Mike Fasano. Description: Warrant Jani Lane 8x10 White Board Autograph. Signed by Jani Lane in 1990 band in blue sharpie pen. Note: This item signed on Warrants 1990 US tour backstage Reunion Arena in Dallas Texas. Description: Warrant Jani Lane and Stevie Blaze (Lillian Axe) 8x10 White Board Autograph. 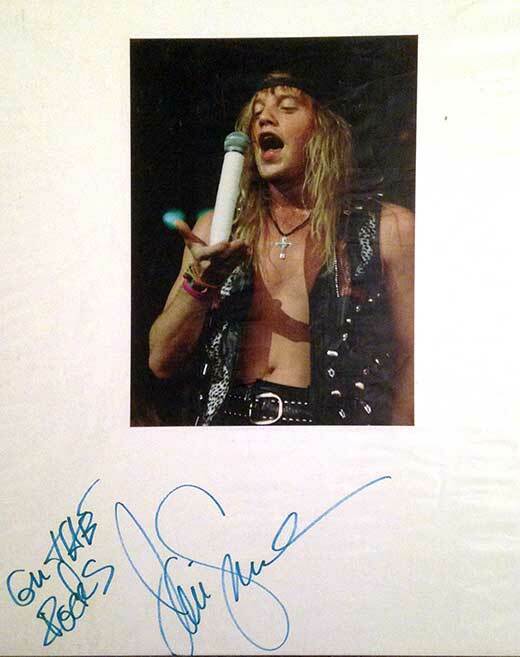 Signed by Jani Lane in 1990 band in black and blue sharpie pen. Note: This item signed on Warrants 1990 US tour backstage Reunion Arena in Dallas Texas. 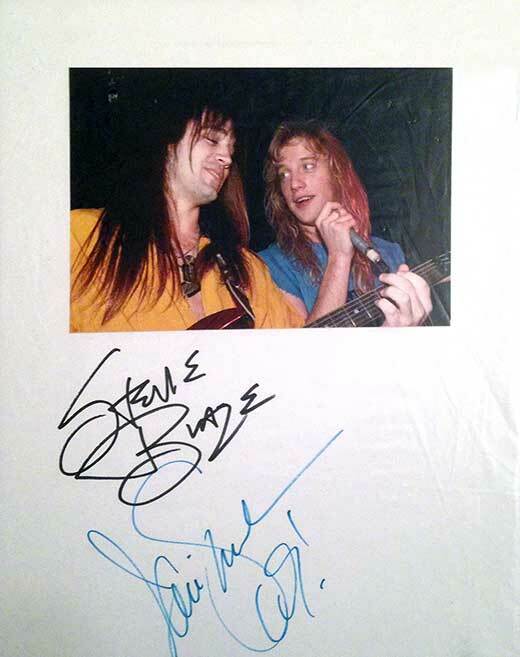 Stevie Blaze signed it at On The Rocks in Dallas Texas around 1990. Description: Warrant Jerry Dixon 8x10 White Board Autograph. Signed by Jerry Dixon in 1990 band in black sharpie pen. Personalized to Mike. 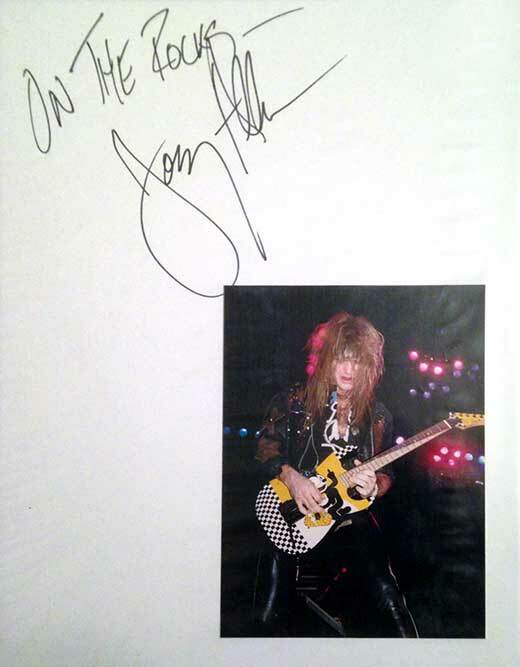 Description: Warrant Joey Allen 8x10 White Board Autograph. Signed by Joey Allen in 1990 band in black sharpie pen. Personalized to On The Rocks. Description: Whnery Dogs Complete Band, Signed by Mike Portnoy, Billy Sheehan and Richie Kotzen in blue, red and green sharpie pens. Note: This item signed on their 2015 US tou backstage at the Granada Theater in Dallas Texas. Description: Whitney Houston 8x10 Color Candid Photo. Signed by Whitney Houson in green sharpie pen. 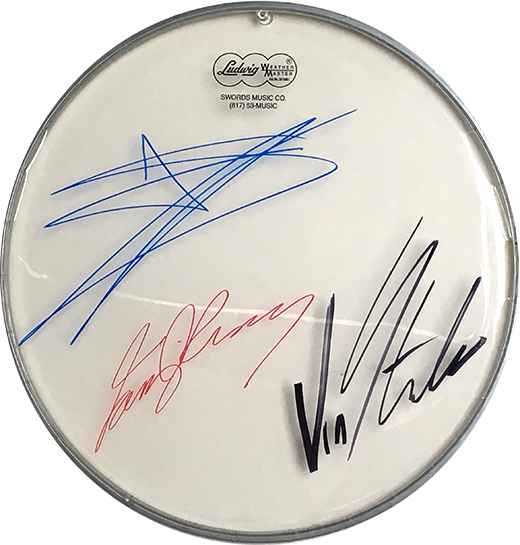 Description: Wolfmother Complete 2014 Touring Band Ludwig Drumhead Andrew Stockdale Vin Steele Ian Peres Signed in blue, red and black sharpie pen. Note: Item signed backstage House of Blues while on their 2014 US Tour in Houston Texas.